The pump circulates the water in the pool. 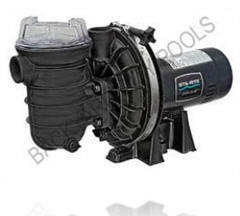 Most pool pumps for residential pools range in horse power from 3/4HP to 2HP. They are controlled by an automatic timer (typically set to run 8 hours per day). The part of the pump that you need to be concerned with is the pump basket… the pump basket collects debris that is missed by the skimmer basket (or from vacuuming). It’s important to periodically clean the pump basket… how often depends on the pool this is something you’ll learn as you go. The timer allows you to set the time of day the pump is active. For most pools, the pump should run approximately 8hrs during the daytime (when it’s warmest). Most timers are similar and will be easy to use. Timers are connected to breakers if the timer does not turn the pump on, check to see if the breaker is off/tripped. A filter cleans the water so the pool stays clear. There are 3 types of filters: Sand, Diatomaceous Earth (D.E. ), Cartridge. 1.Sand: The easiest to clean, however, the least efficient. Typically, we clean sand filters every 3 weeks or when the pressure rises (as seen on pressure gauge). 2.Diatomaceous Earth (D.E. ): The most efficient (and expensive filter). They come in 5 basic sizes: 24sqft, 36sqft, 48sqft, 53sqft, 60sqft. … In most cases, the larger the filter, the longer you can wait between cleanings. Below is a basic guideline for filter cleaning. 3.Cartridge Filter: The most common filter. They range in size from 50sqft to 150sqft. Depending on the pool and size of the filter, the element should be cleaned about once per month – it can be stretched longer on some pools. 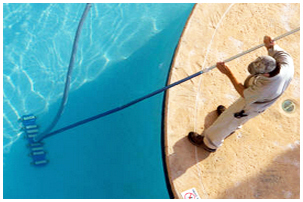 *Most pool piping is either 1 ½ inch or 2 inch.